Frankfurt Christmas Market – An authentic festive experience! In terms of the visitor numbers and size, the Frankfurt christmas Market is one of the most important Christmas markets in Germany. The elaborate and creative stand decorations, the scenic surroundings of the Römerberg and Paulsplatz and the huge christmas tree also make it one of its most beautiful. The Frankfurt Christmas market is one of the biggest in the world. For Christmas gifts that are typically Frankfurt, simply stop by the cosy log cabin situated beneath the market’s massive Christmas tree. There, you’ll find articles including unique, Frankfurt-style Christmas tree ornaments, apple wine soap, Frankfurt slippers and this year’s version of our popular glühwein mug. The entire city is transfromed into a winter wonderland.. 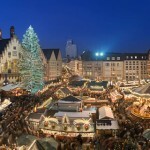 Become acquainted with historical and modern Frankfurt as well as Frankfurt’s famous Christmas market. Enjoy the panoramic view from the balcony of St Nicholas Church, then relive the joys of youth with a ride on a nostalgic merry-go-round. Pick up some unique and memorable gifts and keepsakes. Conclude your Christmas market experience with a cup of mulled wine while taking in the joyous scene surrounding the market’s beautifully decorated Christmas tree. Frankfurt Christmas Market the website.